Seat(s): From the looks of it, there are few legroom friendly seats on this plane. Since the installation of new “Slimline” seats all in economy lose an average 1 inch of seat pitch. Their “slim” profile allowed United to install row 35 where row 34 used to be…which shoves everyone in a little tighter. Bulkhead row 7 in United Economy Plus is one of two exceptions where legroom is concerned. Here, you’ve got a knee-friendly angle in the bulkhead wall and a cutout at the base that lets you stretch into first class. In fact, your legroom in this row is better than half of first class. The bulkhead up front doesnt get much room for feet, just free booze and maybe a plate of hot food. A tall cutout in the bulkhead wall l gives your feet the upgrade to first. The rest of you? Not that lucky. The drawback is that you’ll likely have to tuck your carryon overhead, although we saw passengers accross the aisle slipping their backpacks underneath the cutout and the first class seat in front without any hassle from flight attendants. 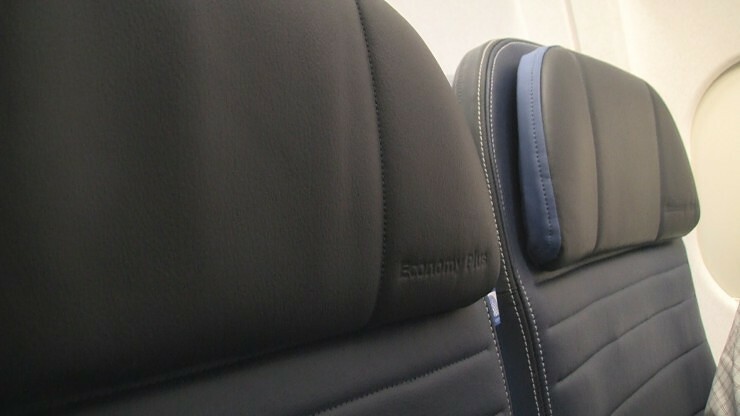 Tech/Connectivity/Entertainment: With the newer style seats we lost one of the last few things we liked about United. The “From The Flight Deck” audio channel let us monitor communications between the ground and the cockpit. What we gained was wi-fi and on-board streaming of movies, TV shows and specialty programming. Still emerging from the infancy of connected services on United’s planes, the wi-fi signal and new entertainment portal (streaming movies, etc) were slow and froze on us constantly. Reports from others have been mixed so the jury is still out (as of Oct. 2014). What’s unfortunate is that the new tech/entertainment options require your own devices. That by itself might be fine with many of us sporting tablets and phones with gigantic screens but all of them eat power like it’s the best cupcake ever. Charge up your devices before you hop on board because personal at-seat power wasn’t a part of the remodel plan for this plane. The breakfast sandwich wasn’t the best thing we’ve eaten on an airplane but beats our most recent United food experiences. Food: I’ve been pretty straighforward about the food on United flights and it hasn’t been pretty. This time though the Choice Menu options weren’t half bad. The hot ham and cheese sandwich was a solid improvement over our last food purchase in economy. 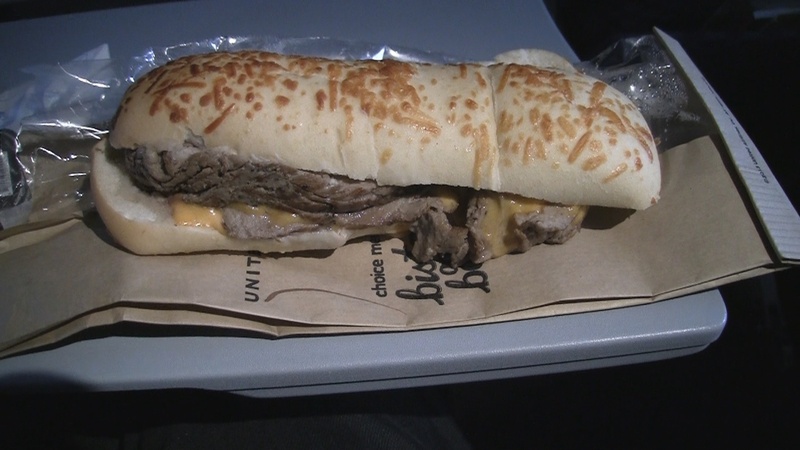 This might be a part of the airline’s food improvement initiative…or we just got lucky. Service: For a United flight, the service was top notch and that’s just strange. If you’ve read our other recent reviews, you know that the kind words are few and far between but there’s an odd phenomenon in that we only seem to be happy walking off United’s A320 family aircraft.Why are these crews so much nicer than aboard other United flights? Are the galleys more luxurious? Do they keep laughing gas canisters up there? Coincidence, I’m sure. Kudos for the friendly A319 crew. Thanks for the smiles and multiple thimbles of coffee. We use a Canon ViXIA HFS-100 for our video reviews. Usually just our phones for gallery stills. I have booked a flight in seats 7A and 7F respectively for my round trip and was curious about the under seat storage. I have a camera backpack that I want to store there and would like to know if that space is bigger or smaller than the standard one in the other economy plus rows. Thanks.